Somnidren-GH Ultra maximizes the body’s recovery and growth period, promising to deliver results in muscle growth unlike any other supplement. Most HGH supplements are an amino acid complex coupled with herbal stimulants to get the pituitary gland to turn the amino acids into HGH. However, when the body thinks its done growing it will take those same amino acids and make somatostatin, the HGH shut-down hormone. Somnidren-GH Ultra by Millennium Sport Technologies (MST) addresses this problem. As a before-bed supplement, Somnidren-GH Ultra maximizes the body’s recovery and growth period, promising to deliver results in muscle growth unlike any other supplement. The main hitter in Somnidren-GH Ultra is its GH-XS, a somatotrophin support complex. With HGH supplement regulars like GABA, an amino acid blend and herbs that not only stimulate, but relax. 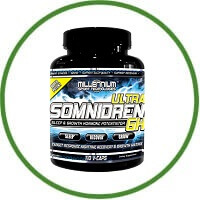 Somnidren-GH Ultra helps the user get more out of sleep, the body’s growth period. However, many of the ingredients are controversial, with psychotic side effects including addiction and over-stimulating bodily functions. Somnidren-GH Ultra is generally safe when used as directed, but special care should be taken if it is to be taken in a stack. MST also tried to address HGH’s anti-hormone with SOMATOSTAT-X, which is designed to allow the body to remain in HGH production mode longer. However, there is little evidence aside from anecdotal that supports these claims.